Utilities want more flexibility. Customers want new apps and independence. It’s a win-win. How would you rate your utility company’s service? Have you ever called your utility company, or visited its website? A survey conducted by the Energy Research Council found that 30% of electricity consumers have experienced billing problems. Billing errors, unauthorized changes to service, and opening or closing locations are just a few occurrences that cause customers to seek support. But today’s customers don’t want to call customer service and hang on the line for several minutes while hearing “your call is very important to us, please stay on the line…”. So how do utilities adapt to ever-changing customer expectations and new technologies in order to stay competitive and grow their customer base? Leading utility companies understand that in today’s competitive market, it became very expensive to grow an utility customer base. Studies from Harvard Business School show, that depending on what industry you’re in, acquiring a new customer is anywhere from five to 25 times more expensive than retaining an existing one. So the best strategy a company can choose for growing their customer base is to provide existing customers with the best possible service and thereby grow brand loyalty. This helps to make sure that existing customers don’t go to a competitor, and to increase the probability that they recommend your service to their friends and family. Let’s be honest, a recommendation from a friend is always worth more than the best marketing ad a company could come up with. Many consumers are trying to lower their energy costs and tend to switch providers before the winter. So right now is the best time for your company to start planning your next campaign on growing the customer base in 2019. What’s up with today’s customers? Many vendors often make the mistake of recruiting a customer type that no longer exists as the company has a fundamentally outdated notion of today’s customer and their expectations, preferences, and desires. In the past, you had one hairdresser, one dentist, and only one energy provider. These providers were trusted for a lifetime. In reality, this type of consumers still exist. They form the first customer type that includes clients who have signed a contract many years ago, issued a direct debit mandate, and have not dealt with this subject since then. Customers belonging to the second type of customer are constantly changing their provider. And the number of people willing to change is constantly increasing. According to the latest study by PwC, more than half of all consumers regularly change their service provider. A similar number of customers are thinking of switching providers over the next 12 months. This is because nowadays there are many providers and thus a wider selection. Today’s customers only need to visit Chooseenergy or Allconnect and choose their nearest electricity provider based on the price or friend’s referral. Retaining existing customers means fulfilling their expectations. Probably the biggest influence today on long-term customer loyalty is the adherence to customer expectations. Since only satisfied customers would recommend a provider, energy providers should keep their promises and avoid disappointments. If you want to retain your new and existing customers for a long time, you must meet the customer’s requirements, respond properly to complaints, and offer an exceptional customer experience. Customer Experience – the experience a consumer has with his/her supplier plays an increasingly important role in the service industry. Industry experts have been working for a long time to improve the customer experience in terms of services offered. Their goal is to bind users and providers emotionally. Anyone who wants to stay in the race as an energy provider must also invest in customer experience. 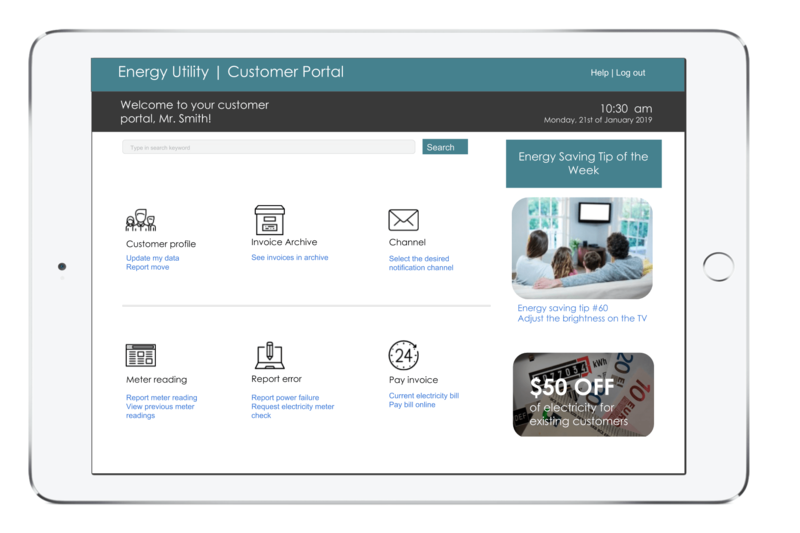 One of the most important tools that every energy provider should have today to help them improve their customer experience, is a mobile customer portal. According to PwC, in the U.S., even when people love a company or product, 59% will walk away after several bad experiences, 17% after just one bad experience. 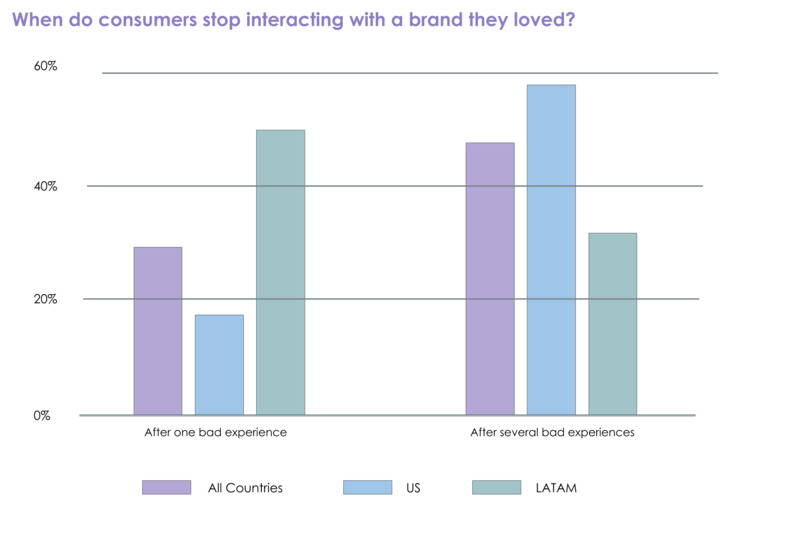 32% of all customers would stop doing business with a brand they loved after one bad experience. Today’s customers want to be more independent. They want to be able to access certain aspects of the services offered by the provider independently. In addition, today’s customers prefer to fill out a form, or change the tariff online, and not call customer service. In other words, modern customers are looking for a higher degree of self-sufficiency and expect you as a supplier to understand and realize that desire. As a result, the provider can not only improve the customer experience but also reduce the call center costs by up to 55%. Customer Portals can be used to interactively communicate with customers and increase customer retention: web portals and mobile apps can provide customers with quick and comprehensive information about your current plan, relevant services, monthly usage, and much more. As a document and output management expert, Ecodocx develops web portals as part of Customer Experience Management matching the design desired by the customer. This portal will provide detailed information on demand. No matter if they want to look at their information and possibly update something, enter their current meter reading, report an outage, request a gas, water, or electric meter check – this portal will help them. In the “Customer Communication” section, discounts can also be used to motivate customers to request e-bills in the portal, by email, SMS, fax or any other digital means. Customer data can finally be used efficiently to recommend the best rate, depending on your consumer’s history. Also, the next home move will not be a problem with the “move” option and an easy and quick change of address thanks to matching form in the portal. As a result, consumers get full transparency about their energy consumption and stay in constant contact with their provider. A classic win-win situation for both sides. Customer loyalty is and remains a challenge for energy suppliers. Intelligent software solutions such as a customer portal can provide much-needed assistance. Whether customers use the portal to explore their consumer behavior, report an outage or pay online, one thing is for sure – this type of customer communication is the key to the client’s desired independence. If you would like to to know more about customer portals and how they can be integrated into your existing ecosystem and business workflow, feel free to contact us.